A series of special art performances celebrating New Year 2014 will be taken place throughout the country. More than 30 leading singers will take part in the ‘Hello 2014-VTV New Year Concert’ to be organized by Vietnam Television in Hanoi on January 1. Artists including Thanh Lam, Hong Nhung, My Tam, Ho Quynh Huong, Tung Duong, Ho Ngoc Ha and Quang Dung will bring popular Vietnamese and international songs to music lovers. The annual concert will use spectacular visual effects used in motion pictures that will be implemented by talented staff members, said Director Do Thanh Hai. The show will be broadcast live on VTV1 Channel. Ho Chi Minh City will also organize many fun-filled activities to welcome the New Year, announced the Municipal People’s Committee. A festival is being run at the 23/9 Park in District 1 from December 27-January 1. The event will feature a series of cultural activities, such as exhibitions on the achievements of the City’s socio-economic development, the agricultural industry and new rural development program; display of construction plan by 2025; and art performances and a food fair. In addition, a ‘Street Lighting’ program featuring thousands of colorful lights in the City Center is being taken place from December 19-January 2. High-range firework shows will be held at the front end of the Saigon River Tunnel in District 2 and Dam Sen Park in District 11 at midnight of New Year's Eve, and to ring in the New Year. 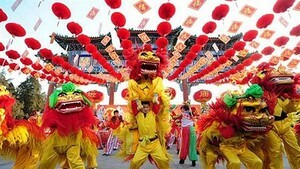 The City will also organize art performances along Ben Nghe Canal in Cau Mong Area in District 1 and Gia Dinh Park in Go Vap District on December 31 and January 1; a bike race on Mai Chi Tho Street in District 2 on December 29; traditional boat race on Tau Hu-Ben Nghe Canal on December 30; music shows in student dormitories, processing and industrial zones, district cultural centers throughout the City, Nga Ba Giong Martyr Monument in Hoc Mon District, Ben Duoc Temple in Cu Chi District, National Cultural and Historical Park in District 9 and Can Thanh Town in Can Gio District on December 31 and January 1.